U.S. rep returns with "aggressive" and "in-your-face" fighting style. 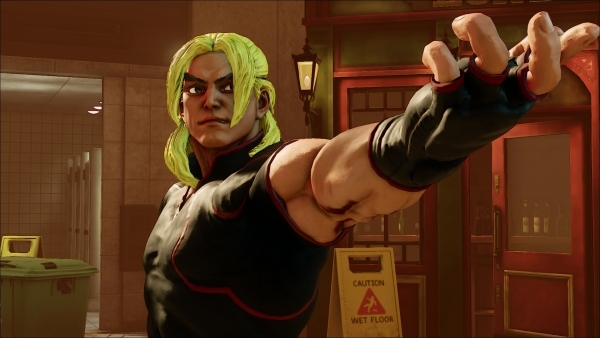 Ken Masters will join Ryu, Chun-Li, Charlie Nash, M. Bison, Cammy, and Birdie as playable characters in Street Fighter V, Capcom announced during its Street Fighter V panel at Comic-Con in San Diego. The redesigned Ken fights differently from Ryu, employing “an array of new abilities,” including fast-moving, long-range attacks, and uses an “aggressive, in-your-face” fighting style to unleash flashy combos and deal big damage. His V-Skills will allow him to extend combos or step back to create distance. See Ken in action below. View a new set of screenshots at the gallery.